Berlin - 1. FC Köln have made their best start to a season in 26 years, but Hertha Berlin are formidably strong in the Olympiastadion. Will something give when the pair meet on Tuesday (kick-off 20:00 CEST/18:00 GMT)? Ten points from their opening five games marks Köln's best start to a season in 26 years.Hertha have lost just one of their last eight home games — they were last beaten at the Olympiastadion by Borussia Mönchengladbach in April (1-2). 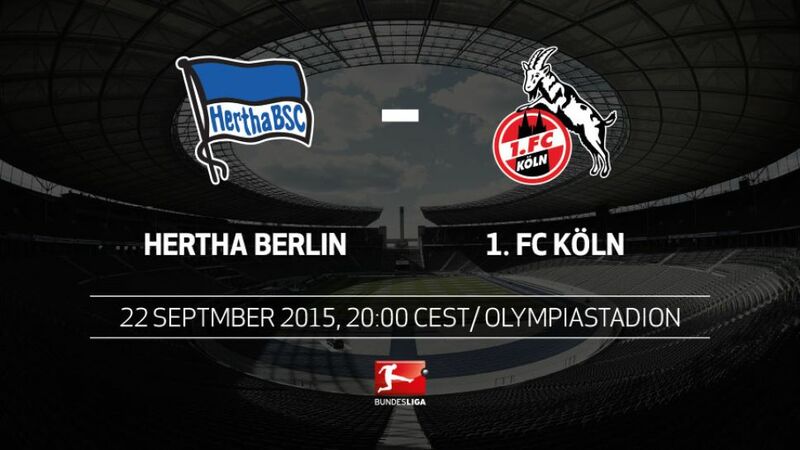 However, Hertha have not won two home games in a row in nearly a year, and have never done so under Pal Dardai.Köln have won just three of their last 11 meetings with Hertha, who have triumphed seven times in those fixtures.Anthony Modeste has scored in each of his last three games, and has seven goals in six competitive outings this season. He is the first Köln player since Thomas Allofs in 1988/89 to have four goals after the first five matches of a campaign.Hertha forward Vedad Ibisevic has not scored in 25 Bundesliga games, stretching back over 20 months.